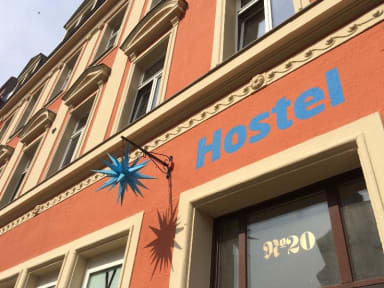 Just opened in June 2014 Hostel Blauer Stern is located in a newly refurbished old urban building right beside the marketplace of Lindenau in the west of Leipzig. Since a long time the so called WESTKULTUR in Plagwitz, Schleußig and Lindenau represents the free, alternative art and cultural scene of town. With eleven quite different guest rooms on three floors and a green, cosy inner courtyard we offer you a comfortable and caring atmosphere with the important space and liberty to experience this wonderful city. Around the marketplace you find everything you need – theatres, galleries, restaurants, pubs and a lot of shopping facilities are nearby. Not to forget the traditional weekly market on Thursdays and Fridays. * children under 7 years we won't charge anything! 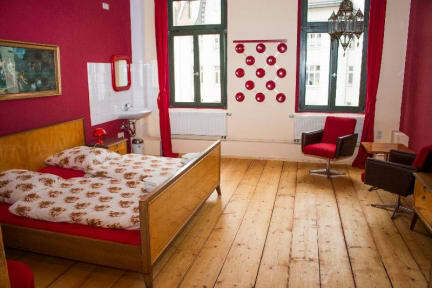 I really liked the atmosphere of this hostel, and host Olivia is very friendly and helpful. The neighbourhood has some nice places to eat (a good falafel just across the street, and the Pizza Lab a little further seemed popular among students), and the art galleries in the old cotton mill are worth a visit. A large supermarket is within a minute walking distance. With a tram station just outside the door, other parts of Leipzig are also easily reached. Definitely recommended!